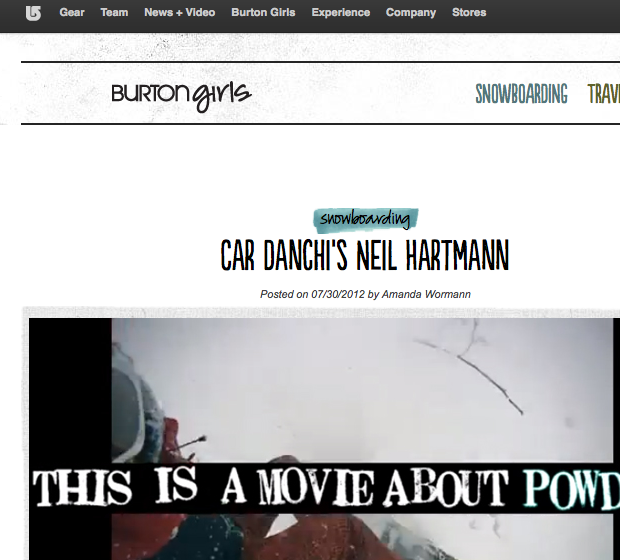 Nice to be featured on the Burton girls website with a little interview about the latest edition of Car Danchi. The new Car Danchi 6 teaser is ready for viewing on YouTube. Watch both English and Japanese versions. Here is the English one. The new Car Danchi 6 teaser was released today on YouTube in both English and Japanese. Here is the Japanese version! I hope this gets you excited for winter! Sorry for the lack of updates here on the blog, I have been locking myself in the editing studio everyday and night working on the new Car Danchi 6 movie. The editing process is always a tough one as I do every single thing myself and of course there is a deadline that adds some pressure! I am working with the new version of Final Cut X and I am liking it. I guess you have to like something that you stare at for 16 hours a day right? Editing is a very personal thing, I think everyone probably has a slightly different editing style depending on what the end project is and how they like to organize their work flow. I never went to editing school, I just read the Final Cut manuals and watched tons of tutorials on YouTube. That will teach you the technical details of the software but it doesn’t teach you how to edit a movie. Flow, rhythm, and holding the viewer attention is something you just have to feel as you go along. The new software seems to have its haters, but it is working really good for me right now. The speed with which I can get a rough edit organized has increased a lot! The magnetic timeline is a brilliant feature I love it. Hopefully you will be able to see the benefits in the final version of the next Car Danchi. I know most of you are probably not interested editing software, but just to give you an idea of what my days are like here are a few tutorials for you! Put on your seatbelt, it is pretty exciting stuff!